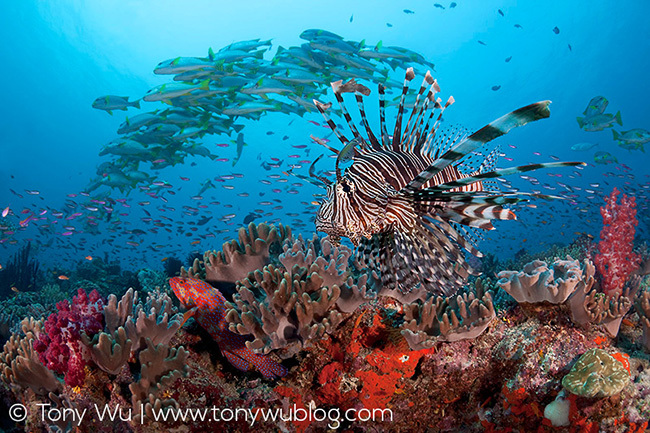 I'm headed out the door again, to Palau to see massive fish spawning aggregations. Though I didn't have much time after getting home from my previous excursion, I managed to get a surprising amount of stuff done (what's left unsaid of course, is that I managed to leave an absolutely shocking number of things not-quite-yet done!). One box I checked off was getting a couple of images prepared and available for print sales. 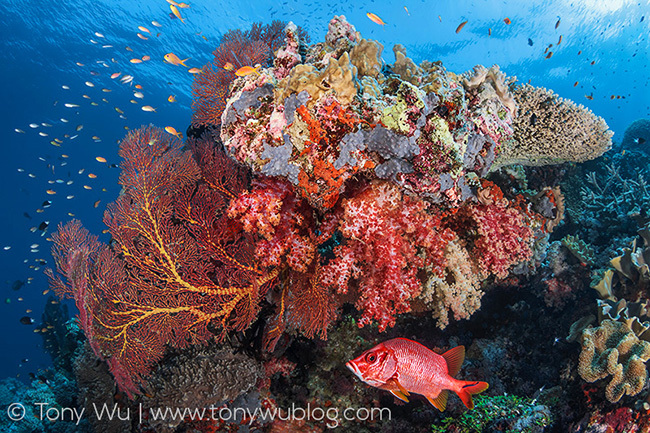 I really like this image because (a) the scene depicted is like a marine-life tapestry comprising multiple layers of interwoven biological complexity; and (b) this is a very accessible reef, right outside Port Moresby, meaning anyone can dive there. I was staying at Loloata Island Resort when I took this photo. A very understanding man in South Africa who attended a presentation I made in Port Moresby in May 2011 waited until quite recently for me to prepare this photo and send him a high quality fine art print. Thank you for your patience Philip! The second is another image from PNG, this one of a sabre squirrelfish (Sargocentron spiniferum) peeking out from beneath a magnificent coral formation at one of my favourite dive sites, Carl's Ultimate reef in the Eastern Fields (accessible on liveaboard trips with MV Golden Dawn). This one is another personal favourite, because (a) just look at the density of life on that coral/ sponge outcropping! ; and (b) it took that brilliant-red fish about 90 minutes to work up the confidence to come out from under the rocks to say hello. I'm making both images available as open-edition prints, which you can order from this page if you feel so inclined. Each image will be custom printed upon receiving an order, with my signature and logo stamp. I'm using Fuji Crystal Archive paper and a photographic process to print the images. The result is reminiscent of Cibachrome printing, for those of you old enough to remember how lustrous and all-around awesome those were. I'll do my best to make more images available soon, but for now...it's back to the airport.